Last week it was all about half marathons on the race calendar. With one such race already marked off the calendar for 2009--the March Madness race Liz just recapped--the distance running season is already off and well running. Before the Bank of America Chicago Marathon up and closes far-ahead of its October 11 race day--last year the race closed in mid-April--or other races up their registration fees to the point where you're not sure if you're either committed enough to the distance or if your bank account can handle the withdrawal (check out this story on how the economy affected marathoners), consider adding a marathon to your race calendar. You can still start training for a late spring race like Cleveland, Green Bay or Rock 'n' Roll San Diego without being too far behind in mileage, or plan ahead for fall classics like Chicago, New York (accepting lottery entries until May 1), Marine Corps, or the Nike Women's Marathon. And with marathon participation numbers growing each year, this is one place/event where it's OK to join the crowd. Big Sur International Marathon--I was surprised to learn that with little more than a month out this April 26 race still has registration openings. This popular race is also one of the more challenging out there--from both having to train all winter and having some of the toughest bout with hills, even steeps. Illinois Marathon--this first-time race is filling quickly, less than 200 spots left, and approaching way too fast. April 11 will be here before your legs might want it to come but if you've trained all winter, it's one way to get in an Illinois-based race (especially if you're shooting for 50 races in 50 states) without running Chicago. Lake Geneva Marathon--racers flock to Wisconsin lake country May 9 for this race. The perk is that if you're not prepared to run the full marathon you could always back out and tackle one of the shorter distance races taking place that weekend. Grandma's Marathon--this is one to plan for 2010 if you want to head into Minnesota's Iron Range to run this popular race. You have to request applications in January and the race fills quickly. Good news too is that the hard-core headphone ban enacted the past two years has been lifted with the new regulations by the USATF (Grandma Lutter, this means I'll think about running this race again). 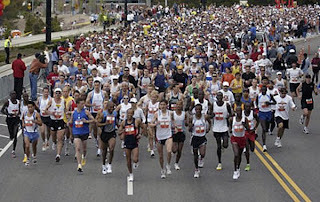 Detroit Free Press Marathon--October 18, this race continues to grow in size but not at Chicago or New York levels. And it features the only race run in two countries with runners crossing the Ambassador Bridge and Windsor Tunnel between the U.S. and Canada. California International Marathon--December 6, while you'll find rolling hills during the first half of this point-to-point race, it's essentially all downhill--and fast. Grand Rapids Marathon--this race saved the day in 2007 after runners sweat, crawled and boarded buses to the finish line of the Chicago Marathon by offering discounts to those who couldn't run Chicago. Turns out that the Grand Rapids race (October 18) gets a good rep even beyond the fee savings--runners have recommend it to me as a great race that's well run and organized, and fast too. Portland Marathon--October 4, when other races said it was illegal to run with headphones, Portland maintained that you could run there with your tunes. Now it's just a great tune-friendly race in a great green city. Honolulu Marathon--December 13, what better excuse do you need to head to Hawaii in December? The hills and climb up Diamond Head can be tough, but paradise is worth it. Baltimore Marathon--October 10, this popular East Coast race draws Marine Corps spillovers and Boston-qualifier seekers, plus you finish with a run through Camden Yards. Nike Women's Marathon--October 18, this race has become so popular that it's now limiting entries to a random drawing. Will you be so lucky to get in and come home with a Tiffany finish-line award?